The list below is all about non-touristy places you can go if you are planning a mini road trip from Montreal. You could visit some of these places in a day, but for some others, you would need at least 3 or 4 days. The range of possibilities to do outdoor activities in USA is very wide. From canoeing to expeditions of unexplored territory, and easy to very difficult hiking, or fishing and climbing… the range seems to be endless. The goal of this post is to propose outdoor activities that are feasible for fast-preceded travelers or amateur adventures that want to discover what USA can offer. In the previous posts, we proposed places in the provinces of Quebec and Ontario. Now, we are going to list outdoor activities in 3 of the New England Estates — Vermont, New Hampshire, and Maine. It might feel that they are further than other places in Quebec, but it is actually quite the opposite. Montreal is only 40 min away from the US border, that makes it extremely feasible to visit the rural north of the US. Why: Rustic atmosphere. Verdant land. One of the facts most appreciated by travelers is the landmark anti-billboard law. The state has been billboard-free since 1968! It is amazingly weird to drive during hours and realizing that all you can see is the uninterrupted beauty. The hills and the forests are so pristine, they are only contrasted by some farmlands. This is rural America! As well as the other neighboring states, there’s a good variety of wildlife including beavers, moose, coyotes, black bears, and white-tailed deer — it is shockingly easy to spot them on the road. This range of mountains extends from the border with Quebec in the north to the border with Massachusetts to the south. It is about 400km and it includes around 11 peaks. The highest is Mt Mansfield with 1339 m. I have climbed several of those peaks and all of them are extremely gratifying because the views at the top are beautiful. Usually, the ascents tend to be easy at the beginning. As you go up, the possibilities to bump into small waterfalls, ponds, and streams are higher. After that come the steep ramps. Be aware that on the peaks, the climate is considered subarctic. Be prepared and pack warm clothes even if it’s summer. Exploring Vermont’s state parks is the best way to discover and enjoy its nature. Most of them have very nice and rustic campgrounds. Check this website for hikes and campground information. There are many day hikes from easy to moderate, and it includes a part of The Long Trail that hikes up and around Mount Mansfield. The reservoir includes many beaches and islands. It features 28 remote campsites and you can only get there by boat. The park is undeveloped and only low-impact recreational practices are allowed. This is paradise! All state parks are beautiful, and so the boundaries of the cities and towns. Rivers, ponds, lakes, waterfalls and rough nature are present in all parts of the state. There are also many covered wooden bridges, they just add up to the romanticness and charm of Vermont. There is also a good chance to spot wildlife animals, including beavers, moose, coyotes, black bears, and white-tailed deer. You just need to be very cautious, especially if you are planning to camp. Bears are very curious! Burlington is the biggest city, and it is worth a visit, but make sure you get lost on secondary roads to discover some other smaller towns because they still hold this utopian and bucolic vibe. It is a 440km backcountry trail that crosses the State of Vermont up to the border of Canada. It crosses around 70 backcountry campsites (many of them featuring shelters) and offers endless hiking opportunities for the day hiker, weekend overnighter, and extended backpacker. Vermont is also very popular among climbers. Even experienced Quebequers are willing to cross the border to climb the Vermont walls. Bolton is the most popular area, but there are many other places spread out around the state. If you are interested in climbing in this state, I would recommend you to download this app. Why: Live free or die. New Hampshire is a mirror of Vermont, even the White Mountains are a reflection of Vermont’s Green Mountains. The range is considerably higher, making Mt Washington (1927) the roof of New Hampshire. The peaks are a bit more demanding, and the weather is a bit more severe. I would recommend climbing Mt Lafayette instead of Mt Washington. The trail starts with an easy hike, crossing streams and waterfalls to then ramp up to the endless trail to the peak. Whereas Mt Washington can be reached by car, so you can expect more tourists. On the other hand, there is a cog railway that can make your visit a bit more interesting. Like Vermont, Maine’s most appreciated thing by travelers is the landmark anti-billboard law. The state has been billboard-free since the 80’s! There’s also a wide variety of wildlife, and there’s a good chance you will spot some of it while driving through secondary roads. Why: Rough Coast and rural mainland. The Appalachian Trail is a 35ookm long scenic hiking route that crosses from Mt Katahdin to Springer Mountain in Georgia. It is considered the longest hiking-only trail in the world. If you are not feeling doing the whole trail, you could just hop on at an intersection and hike a small loop. It is quite popular but there is a really good vibe. Why: Perfect stop between Montreal and the coast. This is the perfect stop if you are heading to Maine’s coast from Montreal. It is a beautiful place with lakes, mountains and rivers. There are many beautiful day hikes. The Appalachian Trail crosses this preserve so you could hop in the trail. Coming from Montreal, at the entrance of the park, there is a petrol station where they rent canoes. It is possible to rent a canoe for two days and spend the night in one of the islands. Driving around here is very pleasant. Most of the roads are quiet and the landscape is spectacular. Baxter State Park is a large wilderness area. 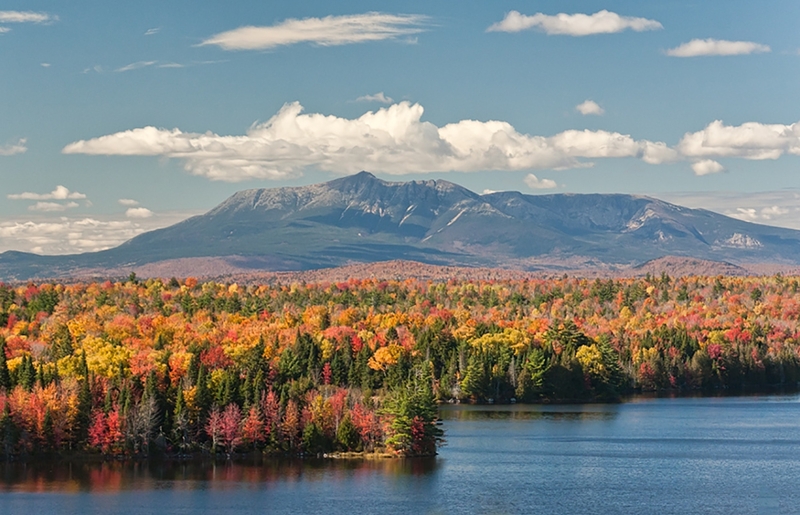 The highest peak is Mt Katahdin (1,605m) and it is also the northern end of the Appalachian Trail. The ridge and the area, in general, are the most alpine-like place I have seen in North East America, also one of the most beautiful and wild areas. To climb Mt Katahdin is challenging, so bear in mind your own condition. Visit the State Park website for more info. Why: Rough coast, small island, lakes and vegetation. All in one place. Acadia is the only National Park in the North East of the United States. It consists of a rough coast with lots of small islands. It also includes mountains, an ocean shoreline, woodlands, and lakes. There are many day hikes and kayak excursions, but the last one I wouldn’t recommend it since it’s only allowed with guided tours. A very nice and adventurous hike is the Precipice Hike. It is half hiking half via ferrata. Although you don’t need gear, you just need to be cautious about your own possibilities. A nice place to spend the night is the Blackwoods Campground. It is in the woods but so close to the ocean that you can hear the waves. Acadia National Park is a beautiful place, but there’s a bunch of people. You can still find your way to less crowded areas and enjoy the nature. Cutler offers the same scenery as Acadia without the crowds you could find in Acadia. A typical day or two in Cutler would consist on following a loop trail and spending the night in one of the campsites. There is a limit of people to camp in specific places, but nobody seems to control it. Just use common sense and leave no trace. Check this sample route of a loop trail and some campgrounds along the way.